DIY or Salon? If you are comfortable enough doing your own hair (and low on cash), it is perfectly acceptable for you to do your own dye job at home. You can pick up a box of dye almost anywhere, local drugstore, beauty supply store, even the grocery store. If you are going to attempt this yourself, research proper application and be 100% sure on your color choice. If you're unsure about a DIY job, go to a professional and they can help with application as well as color selection. If you are nervous about color, it may be best to try a hair color rinse first, rather than permanent color. A rinse will still give you the chance to try a new color, but without the permanent commitment. Most hair color rinses only last 6-8 shampoos because it only stains the outer layer of hair versus penetrating the shaft and depositing hair color like a permanent dye. Although a rinse gives you a temporary change, remember that it cannot lighten your hair, so only consider this option if the color you want is deeper than the color you already have. Henna, nutmeg, tomato, hibiscus, honey, etc. 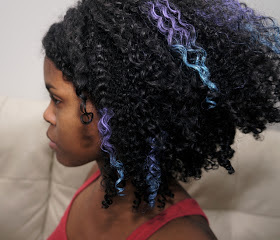 While many of these natural hair coloring techniques have not really been studied, many have tried them with success. Many work over time, after multiple applications and you generally don’t see a color change immediately. Also most of these can only give you a brown-reddish tint/color, except honey which has been shown to lighten the hair in some individuals who have tried it. Funky for a day? Take a cue from our very own natural hair guru, CurlyNikki and use eye shadow to give yourself some funky highlights! I have tried this myself and it works great and gives you just enough pizzazz and sass! If you are trying this, cream and liquid shadow provides a deeper color and lasts longer than powder. And when you are done painting the town red, blue, orange, or green, simply use a little shampoo and it’s gone! Moisture, moisture, moisture- After you have colored your hair, you may experience some dryness. So, it is imperative that you pay extra close attention to your moisture levels and give your hair lots of TLC. It would be helpful to deep condition at least once a week and use extra oils, butters, and creams to keep your hair soft and moisturized. Whether you are a first timer or an old pro, you still need to be careful when using hair dye. Although it’s not as serious as a relaxer, it’s still a chemical and can cause major damage if done improperly. Research, arm yourself with knowledge, take precautions, and happy coloring! Do you dye your hair? What's your process? How do you maintain the health of your hair? This article was originally published on December 2012 and has been updated for grammar and clarity.